Should I Worry About My Visible Veins? 1 Is It Normal If My Veins Are So Visible? 2 When Is Visible Veins a Serious Condition? People have varying skin colors and tones, and in some individuals, the skin is so pale that it appears almost see-through. This can make the blood vessels in the skin prominent and visible to the naked eyes. You may ask yourself, “Why can I see my veins?” The truth is that it’s mostly related to individual genetics. Prominent veins don’t normally need treatment, but if you are worried, make an appointment with a healthcare professional to discuss the issue. Veins may become more noticeable as you get older. Starting from middle age, the skin starts to thin, which can cause veins to get more prominent. The veins below your skin are usually hidden by a layer of fat tissue. If this fat is broken down, the veins will start to appear. This is particularly noticeable in gym-goers who have built up their muscles. The enlarged muscles then push the veins out towards the surface of the skin. Certain drugs may result in thinning of the skin and veins showing through. The most well-known medicines with this effect are the steroids, so prominent veins could become an issue if you take prescribed or recreational steroid medications. During weight exercises, for example in bicep curls, overhead presses, and push-ups, your arm muscles require a higher amount of oxygen. Therefore, the blood supply to the arms is increased and this may make the veins bulge out. Furthermore, your abdominal and thoracic pressure is increased, which can dilate veins on the face. During pregnancy, as the body synthesizes more blood and the heart beat increases to cope with the extra demands of a growing fetus, the blue veins in the skin of the abdomen, legs, and breasts may be more obvious. If you ever think “I can see my veins through my skin”, it is possible that you have spider veins. 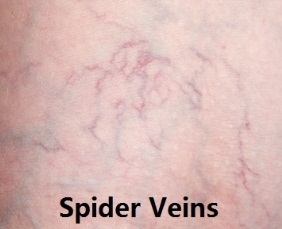 They are known as spider veins because of the web-like pattern they make. Spider veins are most frequently seen on the legs and face. They may be red, purple or blue in color. Another answer to “why are my veins so visible” may be that you have varicose veins. 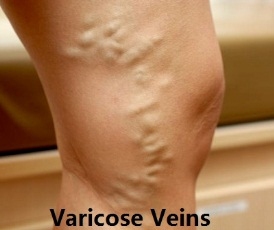 Varicose veins are larger vessels that are swollen and distorted. They stick out from the skin and usually appear in dark blue. They are most common on the ankles and legs, but can develop anywhere. People who stay on their feet all day at work, such as nurses and teachers, are more susceptible to varicose veins. Is It Normal If My Veins Are So Visible? Visible veins may look unsightly, but they don’t usually pose a serious risk to your blood circulation or overall health. However, if you are always wondering “why can I see my veins”, there are some remedies you can take. For example, for small spider veins, try applying self-tan lotion or water-resistant body makeup (e.g. bronzing cream) to camouflage the veins. For veins on the legs, tights or stocking can also be a good disguise. When Is Visible Veins a Serious Condition? Veins are red-colored, swollen, very sore or warm upon touching. Veins have started to bleed. It changes in the color or texture of the skin. You experience sores or rashes on the skin. The condition is causing you considerable distress. You have painful varicose veins, particularly if you have other symptoms. Varicose veins are not a serious issue for most patients and won’t cause long-term complications. However, if you do require treatment, your doctor may suggest first wearing compression stockings. If the veins are causing other health difficulties, you may need surgery. Don’t stand or sit still for long periods – try and move around every hour. Place your legs on a pile of pillows and/or keep them elevated. Take regular exercise to improve blood circulation, as well as aid weight loss.